When you think of Strawberry Shortcake, do you think of cake or biscuits? Since I have such a sweet tooth, I always think of those little round sponge cakes you often see in the produce section, right by the strawberries. Cake is more exciting than biscuits anyway. Lately, I’ve tried to stay away from traditional recipes and instead put a twist on something familiar. However, I just couldn’t do that with the classic Strawberry Shortcake – two layers of sponge cake, whipped cream, and fresh strawberries. This is the cake that first failed when I made my Strawberry Shortcake Truffles. I made too much batter and overfilled the pans. I knew I had a great recipe brewing, so I tried again, this time cutting my recipe in half and successfully baked two layers. Of course you can’t have strawberry shortcake without whipped cream. I kept the filling and topping very simple and used only whipped cream and strawberries. The difference is sliced strawberries are folded into whipped cream for the filling while halved strawberries are piled on whipped cream for the topping. Fun fact – even though I may be a great baker, I cannot tie a bow. See that cake stand? My awesome friend Miriam sent that to me as a birthday gift. However, I changed out the ribbon and spent at least a half hour trying to tie a “perfect” bow. It’s definitely not the same as tying your shoe. 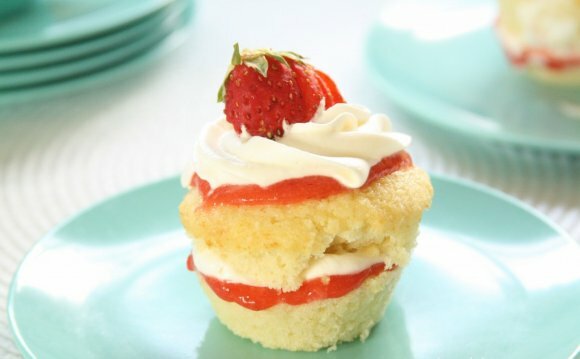 Did you know that tomorrow is National Strawberry Shortcake Day? Me neither until a few days ago. Do I have great timing or what? Now I think we are obligated to make this to celebrate, don’t you? Recipe updated 6-5-15 to adjust some of the ingredients for thicker cake layers. Preheat oven to 350F. Grease two 8-inch round pans (1 1/2 inches deep, 4 cups volume) then line with parchment paper cut to fit the bottom of the pans. In a large mixing bowl, beat together the sugar and melted butter until smooth, roughly 1-2 minutes. Beat in the eggs, one at a time for 1 minute each, then add vanilla. Alternating between the flour mixture and milk, gradually add the flour in three parts and the milk in two parts, starting and ending with the flour. Beat until the remaining flour is just moistened and incorporated - do not overbeat. Divide the batter evenly into the pans then bake 20 minutes or until a toothpick comes out clean. Let cool in the pans for 10-15 minutes then turn out of the pans onto a wire rack and cool completely. In a large mixing bowl, beat the cream on high speed until thickened and soft peaks form (when you pull the beater(s) straight up, peaks form but tips fall over). Gradually beat in the sugar and vanilla then beat until stiff peaks form (tips do not fall over). Keep chilled until ready to use. For the filling, mix together 1 cup sliced strawberries, sugar, and lemon juice. Fold them into 1/2 cup whipped cream. Set aside the rest of the whipped cream for the topping. Place one cake layer onto a plate or cake stand. Top with the strawberry whipped cream filling. Place the other cake on top and gently push down. Top with remaining whipped cream and strawberry halves. Store in the refrigerator for up to a week.